Using Xtgem service to build a site? I think Xtgem is became the best wapsite builder service and stand ahead of the other services. Not only build a simple site, but Xtgem with its advanced features allow us to build a complex site using the features provided, and one of them is Blog function or XtBlog. But one problem on using XtBlog is when we are about to edit a post. It's no problem if we only have simple blog with a few posts, but how if we have dozens or hundreds of post in our xtgem site and we want to edit a post? We must looking from dozens or hundreds of the posts list in the xtblog block in file browser (That could be a serious headache :D ). And that's when this script will come useful. I called this script as "XtQAdminBar". This script will add a floating admin bar on your xtgem wapsite. The main objective for this script is to make easier to manage your xtblog by adding quick shortcut links, especially a link to edit your current viewed post. I got the original script from Mr. Graham@Xtgem, then I made some little necessary modification here. This is the main code, place the code in your _footer file. Replace "YOUR_BLOG_ID" (on line 3) with your blog id. Add it to your css file, or simply copy it to your _headtags file. With the default value above, you can call the Admin bar by adding admkey=1234 parameter in the url, then visit the link. Example you are viewing your blog post which has url: http://mysite.xtgem.com/index/__xtblog_entry/123456-aaa-bbb-ccc?__xtblog_block_id=1#xt_blog. You can change the parameter name (admkey) and value (1234) as you want. Note: The script is only work if we are logged in to the site on Touch/mobile version of xtgem. The admin bar provide link to log in to your current viewed site, if you click it and it NOT showing error, it means you are logged in. Make sure to always click [LOGIN] first before you edit post or create new post! If you are using desktop/PC, the admin bar also provide link to swith version to Touch. Q: How to get my blog id? 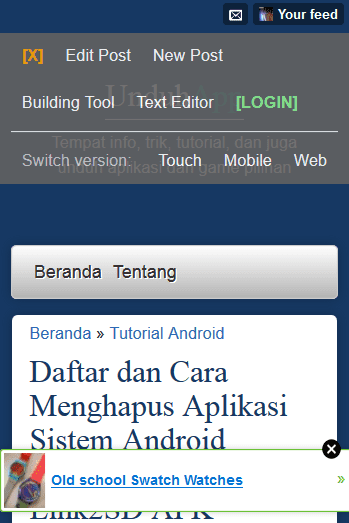 A: Login to your site on Touch/mobile version. Go to your xtblog block in file browser, and copy the link on "New Post" link. 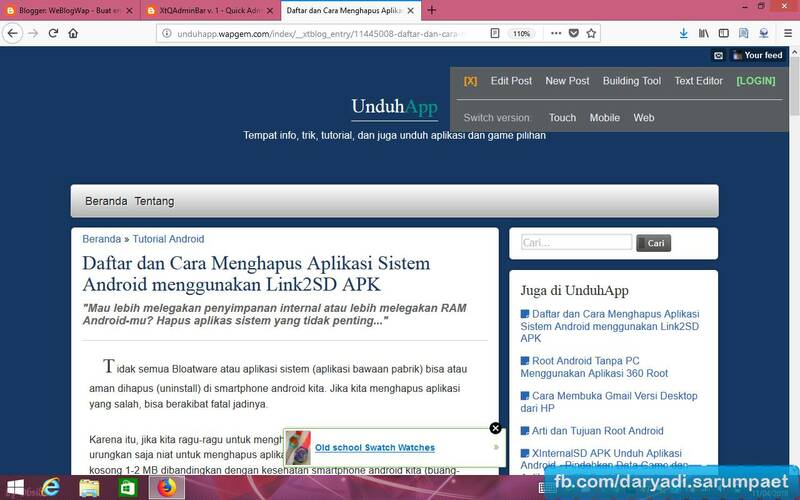 You will get something like "http://xtgem.com/blog/entry/add?blog_id=XXXXXXXXXXXXXXXXXX=&file=index"
Tested and working smoothly on my Windows tablet using Firefox Browser. Stay up-to-date this blog to get the update of this script. DONATE: If you think my script is useful, You can send me donuts or coffee to my PayPal: sarumpaetd@gmail.com . Thanks! Comments (4) in "XtQAdminBar v. 1 - Quick Admin Bar Script for Xtgem Site"
please help.. i would prefer an easy tutorial for this and even for WBWXTB [v. 1.5] - Advanced Blog Template for Xtgem Sites. Any other way to find the Blog ID?